Who Loses and Who Wins in a Housing Crisis? Lessons From Spain and Greece for a Nuanced Understanding of Dispossession. The emerging post-crisis geographies in Southern Europe are intrinsically related to debt and dispossession. In Spain mortgage homeownership and indebtedness led to housing dispossessions, while in Greece, skyrocketing private indebtedness is eventually arranged through housing foreclosures. Building upon the notion of ‘accumulation by dispossession’, i.e. on the way capital accumulates wealth in the era of neoliberal globalisation, this article elaborates two novel concepts to understand the housing crises in both countries: The perception of “dispossession by odious taxation” describes the process of wealth extraction facilitated by financial mechanisms in Greece, and “dispossession by political fraud” is conceived as a characterisation of fraudulent political arrangements and financial tools used for orchestrating housing stealth in Spain. 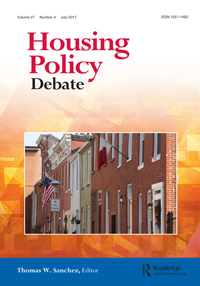 This nurtures the perception that a comparative insight on the processes of dispossession in the Spanish and Greek housing markets may facilitate a nuanced understanding over the interrelated processes of contemporary housing restructuring.